Built in the mid-nineteenth century, Rosewood Country Inn is set in 12 acres of hilltop land and has been meticulously restored to its former glory since being purchased by the current owners in 1991. The hotel has a total of 11 guest rooms all of which are individually styled and named. 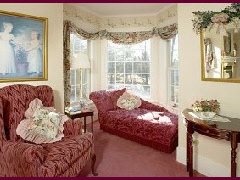 These include the Windsong Suite, Thomas Jefferson Suite and Williamsburg Room.